Pictured, from left, are WCHS intern Madi Howard and CCS volunteer coordinator Lacey Alber. WARSAW — Combined Community Services will host its 11th annual Glass Slipper event on Saturday, April 14. The event helps high school students attend prom by assisting them in finding dresses at no cost and tuxes at a discounted rate. 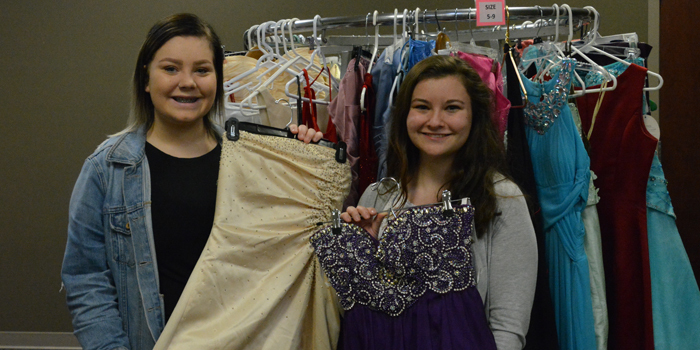 It started 11 years ago when two Warsaw Community High School students realized just how expensive prom can be. Buying a dress, shoes and jewelry for one night can cost a lot of money, and the two students wanted to help others make dreams of attending prom a reality. “The goal of the event is to make prom night a special night for high school students in Kosciusko County without the burden of the high costs that comes with it,” said Alyssa Lowe, director of development at CCS. This year, the event is being organized by Lacey Alber, intake and volunteer coordinator at Combined Community Services, and Madi Howard, a Warsaw Community High School intern. The Glass Slipper event is open to any male or female that is enrolled at a high school in Kosciusko County. Upon arrival, young women will sign in and pick out a dress and accessories. New this year will be drawings for dinner and tux gift cards. Several local businesses have partnered with CCS to make the gift card raffle possible, including Male Fashions, Cerulean, Maple Avenue Flowers, Hacienda and Buffalo Wild Wings. There will also be music and snacks at the event for all guests to enjoy. CCS is still accepting donations. Dresses, shoes, jewelry, purses and gift certificates for dinner will be accepted. Any high-schooler who who wishes to participate can register for the event by e-mailing [email protected] or by calling Combined Community Services at (574) 269-6019. Those planning on attending must sign up before April 14. If you wish to donate any items, you can take them to Combined Community Services, located at 1195 Mariners Drive, Warsaw. They are open from 9 a.m. to noon Wednesdays, and 9 a.m. to 4 p.m. on Monday, Tuesday, Thursday and Friday.